Review: When it came to the creation of these prequels, surely every single Star Wars fan on the face of the planet must have been wondering what brilliance could the creator of this awesome universe throw at us? Our first answer was the horrendously disappointing The Phantom Menace. So when a sequel came along, audiences possibly hoped that Lucas would realise his mistakes, listen to the feedback, and give us something much more closer to the original trilogy. But yet again, the hopes were dashed with another bloated CGI filled mess, with very little substance to it, and the standard of writing? Improve it did not. The emotion that ran throughout the original trilogy is again severely lacking in this film with the completely uninteresting plot and while interest does grow in the latter stages of the film, once the Jedi finally get off their bums and decide to do something to help. The action scenes in this film do offer more but they’re yet again mired by the ridiculous overuse of CGI which like the previous film is so ridiculously apparent it almost hurts your eyes while you watch. The absence of Star Wars sets sticks out like a sore thumb and Lucas once again tries to overload the viewer with CGI, forgetting that there’s a fine balance between great CGI and great storytelling, which again baffles as he mastered that with the very first film we got in the franchise! There are some decent characters in this film too, but again like with Phantom Menace, they’re barely utilised before we have a chance to explore their potential, namely one Jango Fett, father to the awesome Boba Fett, except here he’s not so awesome, he’s another whiny little brat kid, kind of like how Anakin was in the first movie, and in many ways like Anakin is here. Also introduced is Count Dooku, played by the late and great Sir Christopher Lee. His performance was decent and his character is explored a bit more and there is a bit more action involved with his character to boost the excitement, but again it’s over before it really has a chance to get going. John Williams’ score remains as awesome as it always has been but the film is once again bogged down by poor writing, even poorer acting from certain individuals, and terrible TERRIBLE romantic dialogue, and more CGI overload that again does nothing to enhance and or improve upon the very weak story that we are presented with here, which was just not what audiences wanted to see. It was yet again a terrific opportunity squandered and resulted in CGI overkill. 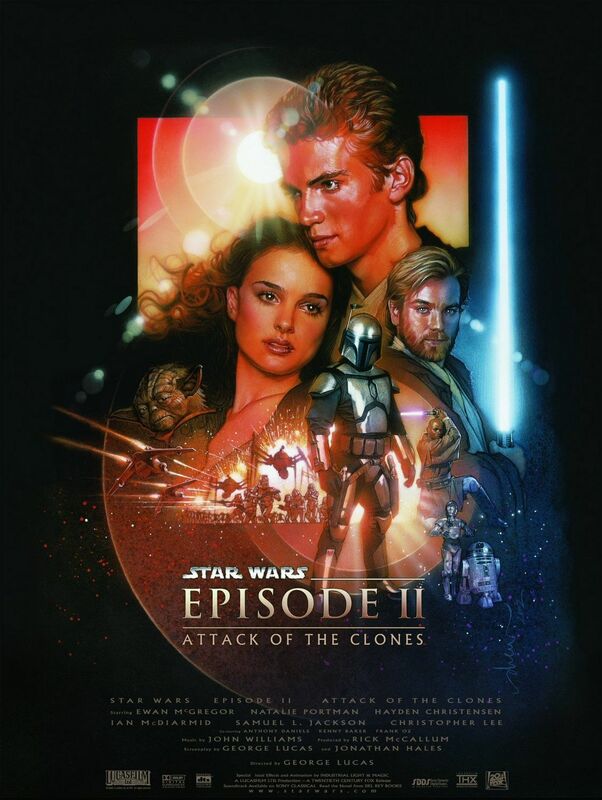 Yet again weighed down by a poor script with some appallingly bad dialogue and even worse acting, lessons were not learnt from Episode I and the CGI is just as noticeable and dated as its predecessor, but it somehow manages to be worse, even with less Jar Jar Binks.